This month is one of the busiest for every orchid grower. After a period of relative dormancy, orchids of every kind are beginning to grow. New orchid growers must learn to recognize when the growth cycle begins. Proper repotting and fertilizing of orchids depends on that recognition. The purpose of repotting should not be to multiply a plant, but to replace decaying medium. A well grown plant, however, will often need a larger pot and yield extra pieces (divisions) for friends. In nature, growth begins with some signal from nature, usually a change in day length or the beginning of the rainy season. 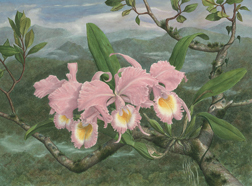 Orchid hobbyists who become skilled growers of species also become competent naturalists because they must learn the key elements of the environment from which their difficult-to-grow orchids come. Most of us do not undertake growing the difficult species, but enjoy the more generic hybrids that are much easier to grow and for which, signs of growth are clear. Standard phalaenopsis, those with large flowers, begin their growth cycle when days begin to get longer and the temperature within the pot remains above 60 F. They will begin growth even with flowers on spikes. However, growth will begin earlier and proceed faster if spikes are removed. New leaves emerging from the center of the old leaves and new roots breaking from the stem just above the last living roots are a sure sign that growth has begun. When this happens, your phalaenopsis can be repotted with the least damage. If your phalaenopsis was a gift, it likely needs repotting. If the medium in the pot seems to stay wet longer or your orchids’ leaves are wilting, it likely needs repotting. Repotting can be as simple as removing the plant from the medium, shaking the old medium from the roots and replacing the orchid in a new pot with new medium. New hobbyists can find lots of information, including videos, on the process of repotting or attend a local orchid society potting demonstration and learn how to repot a phalaenopsis. It is easy. Cattleya hybrids can generally be repotted in spring too. The trick is to begin the process before the orchid initiates root growth. Once new roots begin, there is the risk of damage to these new roots, which may set the plant back. It is OK to repot before roots are seen unless the hybrid is a “bifoliate-type” (very tall pseudobulbs and two or more leaves on each bulb). If you have one of this group, wait until you see new roots, which may be later in the spring or early summer. Members of this group can be killed by repotting at the wrong time. Paphs and Phrags (slippers) are best repotted right after they flower. While they decrease their growth rate when light levels are lower, they will grow all year long. Usually, there is a new growth beginning to mature as the older growth finishes flowering on a plant. Vandas are particularly sensitive to low temperatures. This group of orchids grow best in high light, accompanied by night temperatures above 65 F and days above 80 F. Most mature vandas are grown mounted or in baskets. Hobbyists that grow indoors are often enticed into purchasing vandas in hanging baskets and then left wondering what to do with them. They can be repotted into large clay pots as long as the medium has a diameter of an inch or more. However, it is best to avoid repotting this type of orchid. Once it gets warm, find a place outside under a lightly shading tree and water frequently.